This course is for electricians who are already 17th Edition qualified. The course brings you up to date with the changes in the 18th Edition. Loads of practice questions – complete 2382-18 exam practice plus practice on just the updates. Integrated with Amazon Alexa voice technology, so just sit back and listen. The best value, most effective 18th Edition Update Course available. Sign up and start the course immediately. No need to wait for availability. The focus of the 18th Edition Update Course is on the new and changed regulations. Each lesson and topic concentrates on updates. Also included is the unique Electacourse guide to exam success and practice questions on the new regulations. At the end of the course is a 2382-18 practice test with over 1,000 exam practice questions with answers which include Wiring Regulations references. 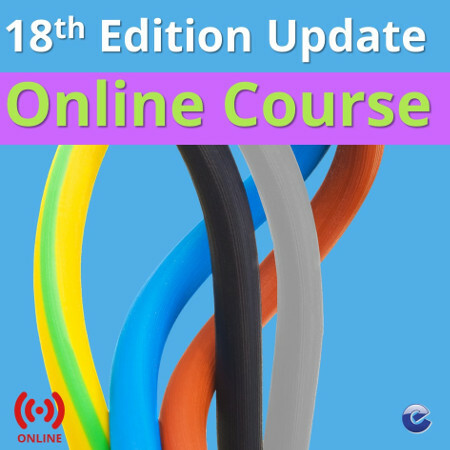 The Electacourse 18th Edition Update Online Course is open to any electrician who is already 17th Edition qualified and wants to update themselves to the 18th Edition. If you do not already have the 17th Edition Qualification, then you will need to do the full 18th Edition Online Course. Every electrician working in the UK will need to be 18th Edition qualified. You could be a student at college or an experienced electrician updating your qualification from previous editions of the Wiring Regulations. Maybe you have been working for a while and now need the 18th Edition Qualification to get your next job. Perhaps you are making a career change to become an electrician or you are an electrician from overseas wanting to work in the UK. Fully up to date to the 18th Edition of the Regulations. Many new questions. When you are 18th Edition qualified you may want to move on to more advanced electrical study. Electacourse are the leading publisher of study and revision material for UK electrical contractors. We have a complete range of ebooks and exam simulators to support electricians intending to become qualified in Initial Verification and Periodic Inspection & Testing , City & Guilds 2391.